In the brilliant scientific paper, ‘The pulse of inflammation: heart rate variability, the cholinergic anti-inflammatory pathway and implications for therapy,’ Dr. Jared M. Huston, Department of Surgery, Stony Brook University Medical Center discovered a neural control circuit that acts to keep the body’s cytokine production, and therefore inflammatory response, in check. During the 1990s, the authors of this review quietly opened up an entirely new way of looking at inflammation. Inflammation is intimately connected to all the major diseases of our times shortening lives and causing pain on a persistent daily basis so this is crucial information that sadly is ignored by contemporary medicine. The vagus nerve is a very long nerve running from the hypothalamus area of your brain, chest, diaphragm, and to our intestines. It wraps around our heart and solar plexus center so it is very involved with our feelings and thinking. We have an extraordinarily hard time healing and even learning when the vagus nerve is disturbed. What Dr. Huston discovered is an anti-inflammatory neural circuit, the vagus nerve, which is controlled with conscious breathing, yoga and emotional and positive mental frameworks. The difference between life and death (cytokine storms) and recovery from chronic inflammatory diseases begins with the vagus nerve that regulates the heart rate variability (HR,)—varying the rate at which the heart beats beat-for-beat. Research has found that the neurotransmitter acetylcholine acts as a brake on inflammation in the body. 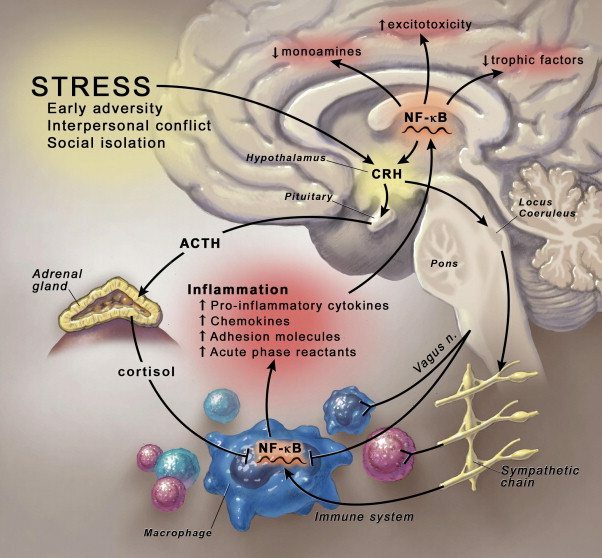 Stimulating the vagus nerve sends acetylcholine (acetylcholine plays part in learning and memory) throughout the body, not only making us feel relaxed, but also putting out the fires of inflammation – something that happens in response to stress. Natural vagus nerve stimulation includes conscious breathing, yoga and emotional and positive mental frameworks. Termed ‘the inflammatory reflex’, this neurological mechanism involves the vagus nerve, which can sense peripheral inflammation and transmit action potentials from the periphery to the brain stem. This in turn leads to the generation of action potentials in the descending vagus nerve that are relayed to the spleen, where pro-inflammatory cytokine production is inhibited. Amongst the leading causes of morbidity and mortality in Western societies are heart disease, cancer, stroke, diabetes and sepsis. Recent advances in immunology reveal a significant pathogenic role for inflammation in the development and progression of these disorders. Inflammation accelerates deposition of atherosclerotic plaques leading to myocardial and cerebral infarction, mediates insulin resistance, stimulates tumor growth, and causes organ damage in lethal sepsis. The way it works is that signals from the brain stem travel to the spleen (which is responsible for a lot of immune system regulation) and act on particular white blood cells (lymphocytes, or T cells). These white blood cells produce nerve transmitter acetycholine to reduce the production of cytokines by macrophages in the immune system. Without the influence of the vagus nerve, cytokines are produced in much larger quantities in response to e.g. bacterial infections. The authors have demonstrated that artificially stimulating the vagus nerve controls the activation of circulating immune cells as well as production of cytokines. Diminished vagus nerve signals normally provide an inhibitory influence on cytokine production. The dangers of uncontrolled inflammation are inherent to the molecular activity of cytokines themselves, and maintenance of health requires tight control over the steps leading to the production and release of cytokines. Cardiovascular disease, the Western World’s biggest killer results from atherosclerosis, itself triggered by the action of cytokine produced C-reactive protein (CRP). Several studies have shown an inverse relationship between HRV and CRP levels and to physical activity levels, where the most physically active people demonstrate the lowest CRP, and highest HRV. This discovery also proposes the reason why health is improved by exercise. 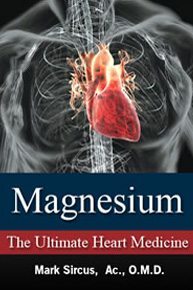 It is directly due to the combination of increased HRV and reduced inflammation. Action potentials transmitted in the vagus nerve culminate in the release of acetylcholine that blocks cytokine production by cells expressing acetylcholine receptors. The molecular mechanism of this cholinergic anti-inflammatory pathway is attributable to signal transduction by the nicotinic alpha 7 acetylcholine receptor subunit, a regulator of the intracellular signals that control cytokine transcription and translation. Factors that trigger inflammation also enhance the activity of anti-inflammatory pathways, which function to counter-balance inflammation. 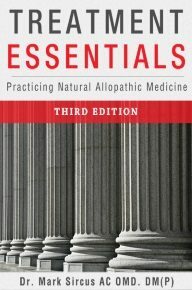 This concurrent activation of pro- and anti-inflammatory mechanisms is analogous to other homoeostatic systems but nowhere in medicine do we see doctors prescribing breathing techniques to get control of this particular neuro pathway to maximize the body’s ability to counter-balance inflammation. Heart rate variability represents the time differences between successive heartbeats (also known as the beat-to-beat interval), and is synonymous with RR variability, referring to the R waves on the electrocardiogram corresponding to ventricular depolarization. The ratio of low-to-high- frequency spectral power (LF/HF) has been proposed as an index of sympathetic to parasympathetic balance of heart rate fluctuation and this is confirmed by the VedaPulse, a remarkable diagnostic machine. Measures of HRV have been strongly correlated to morbidity and mortality from diverse diseases. Early clinical findings, first observed more than 50 years ago, revealed that variability in RR intervals predict the onset of fetal distress before any measurable changes in absolute heart rate. There is now extensive experience using HRV measures in diverse disease syndromes and these data indicate that decreased vagus nerve activity is associated with increased morbidity and mortality. These correlations include increased morbidity and mortality following cardiac surgery or myocardial infarction, increased mortality from sepsis and progression or disease severity in autoimmune diseases, including rheumatoid arthritis, inflammatory bowel disease, systemic lupus erythematosus and sarcoidosis. Prior to knowledge of the inflammatory reflex, it was thought that decreased vagus nerve activity in these cases resulted from neural damage associated with the underlying diseases. 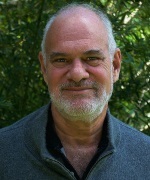 It is now possible to consider an alternative explanation that decreased vagus nerve activity and the associated loss of the tonic inhibitory influence of the cholinergic anti-inflammatory pathway on innate immune responses and cytokine release, may enable significantly enhanced cytokine responses to stimuli that would have been otherwise harmless in the presence of a functioning neural circuit. HRV and vagus nerve activity are useful as a long-term measure of inflammation in chronic diseases. Correction of chronic, maladaptive levels of inflammation using nerve stimulators might prevent the progression of debilitating and deadly diseases, potentially replacing the need for some biological therapeutics. Neurologists and psychologists should take notice that a principle nerve pathway exists that acts as a kind of grand unification station to meld body, mind and spirit. Neurologically speaking the vagus nerve speaks for what is happening on all the major levels of our body and being. Our heart does not lie, not when you look at what it is saying on a beat-to-beat basis (HRV). It is our most honest digital code and doctors can read it using the VedaPulse. A five-minute test done in the comfort of one’s own home or doctor’s office and one has a five minute readout of the code the heart is putting out. Personal Note: There are many ways with or without technology to read into the body, mind and soul of a person. The Russian VedaPulse diagnostic and treatment recommending digital device was very helpful personally in my struggle to get to the bottom of my health situation, which started over two years ago with GERD and ended up mapping out everywhere my vagus touches. I was always nervous, reluctant and downright obstinate about not getting a typical western diagnosis and I have written many books about why I feel this way. 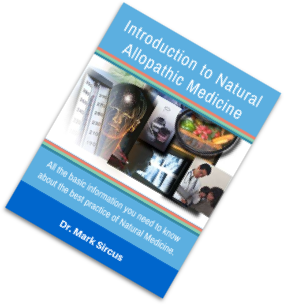 This motivated me to create an entirely new form of medicine called Natural Allopathic Medicine, which I will continue to evolve as long as I have life, breath and love in my life.